The cabin was very. We Loved it all! The view, the hot tub and the decor. Directions were easy to follow, it was great quality time spent together. Awesome Cabin! We came to enjoy the solar eclipse. The view was amazing. We will be back. I talked with the staff twice - once before our visit and once the day we arrived. Kathy was easy to work with and we appreciate that she called to check on us after arriving. We loved this cabin. It was spacious and clean. The 3 bedrooms were nicely located. Our daughter loved the loft bedroom and having her own bathroom. The master is huge and has a large bathroom with a Jacuzzi tub. The upstairs smaller bedroom has the common bathroom right across from it. Kitchen was well supplied. Decor was pleasing. We will definitely come back!! Extremely friendly and they truly did care about making our trip amazing. This is one of our favorites to come relax and get in a few great hikes. Thank you for a homey stay that feels so inviting. The view is amazing and we hope to back soon! Cabin was amazing, completely equipped with everything . Nice and clean. Driving directions were fine, even at night we found the location easily. We will be back ! Beautiful Cabin! Always makes us feel at home. Has so much character, clean and relaxing. We are always so refreshed when we leave! We can't wait to be back at Baines Mountains. Each season has so much to offer. 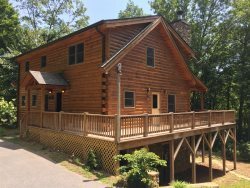 Great Smokys Cabin rentals you are doing a great job!!! Kelli was super helpful throughout the entire rental process. Kathleen gave us a call upon check in to make sure we made it safely and everything was to our liking. We received a phone soon after arriving at the cabin from a staff member welcoming us and asking about the cabin and was everything as it should be. This was a very thoughtful gesture which was much appreciated. Honestly? This was the best customer service ever! I've made several calls before renting that cabin and each time I was greeted as I was a friend. All my questions were answered and all my requests taken care promptly. Thank you so much ladies, you rock!